Believe it or not, there is much to learn from Kellyanne Conway about working with media. During the 2016 presidential campaign, Conway developed a reputation for deflecting the media’s repeated attacks like a skilled ninja. Despite the constant questions and attacks on Trump, she always appeared calm and able to dodge any fireball question hurled her way. Her messages were on-point and, if anything, she seemed somewhat authentic. The cable shows kept booking her for commentary since she was such a willing participant. Now, as a presidential advisor in a West Wing that has seen nothing but crises since Jan. 20, Conway’s presence on TV has started to seem a bit off and the media has caught on to her strategy. Reporters have noticed that statements she is giving are not consistent with messages coming out of the White House. In addition, her non-answers to questions have gotten tiresome to reporters seeking to make sense of the White House’s messages (see Alternative Facts and Bowling Green massacre), and she seems to overstep ethical boundaries without hesitation (see Promoting Ivanka’s fashion line). What exactly can lawyers learn about working with the media from her? Actually, a lot. The lesson for attorneys should go without saying, but we’ll still emphasize it: If you haven’t the foggiest idea about a specific topic, don’t discuss it with a reporter unless you can provide some credible insight and can get up to speed before the interview. Preparation should always be done to ensure you are providing the reporter with accurate and relevant information. Keep in mind that there are always other opportunities to speak with reporters about topics you are well-qualified to discuss, rather than chasing after something that is outside your wheelhouse. You can never walk back credibility, so make sure the face you put forth with the media is a reliable one. Vox reporter Carlos Maza has skillfully deconstructed Conway’s interview techniques in a recent article. He notes that in her responses, Conway “redirects key terms and concepts” to what she wants to discuss. Her strategy is to identify and use key words from the reporter’s question in her answer that – at face value – make it sound as if she is answering the question, even though she is not. Given time constraints, reporters usually move on to the next question at that point. As we can see from tip #1, the point at which she started to show lack of credibility is when reporters stopped letting her answers fly and kept pressing her for clarification. When in an interview, attorneys should also listen to the questions for key words and phrases, and use them in a response when it makes sense. However, make sure the response actually answers the question, or at least relates to the question, even if you are heading in a different direction with your answer. Since reporters rely on lawyers for insight into complex topics, they know when a response doesn’t quite speak to their underlying question and will move on to other sources if you aren’t able to provide them with what they need for their story. You can also pull a “Kellyanne” and use key words from the reporter in your answer to redirect to the message points that you prepared beforehand. When faced with incorrect information from the reporter in a question, gently clarify the facts before redirecting the answer to the point you’d like to drive home. Conway is a master at remaining calm under intense pressure, which made her seem credible and easy for reporters to talk to. She always smiled, even when she was faced with the most difficult of questions. Her unflappable presence and calm demeanor are meant to reassure the public that everything is fine and that Trump has got it under control. Even if her message points don’t resonate, her demeanor and attitude are always on point. Attorneys should always be polite and friendly with reporters and exude a calm, confident demeanor during interviews. When faced with difficult questions from the media, either redirect (tip #2), or simply say that you’ll have to look into the matter and get back to the reporter. Reporters will appreciate it if you do actually follow up with the information so they can consider it for their story. While Conway is indeed (gulp) a lawyer, she is not representing herself as a lawyer or someone bound by the ABA’s legal ethics rules. She represents Donald Trump, and her job is to convey his messages to the media and the public. Her allegiance to ethics, before being employed by the White House, was wherever she (or her boss) set it. Now a White House employee, Conway is being investigated for endorsing Ivanka Trump’s fashion line in an on-air interview, a breach of White House Standards of Conduct. This clear breach of ethical duties and its ensuing investigation will further take credibility away from her in the eyes of the media and the public. Lawyers should always remember they are bound by the ABA Model Rules of Professional Conduct and behave accordingly, especially in media interviews. Among those rules: Never divulge client details without firm or client permission. Lawyers also should make sure there is no firm conflict with whatever topic they are discussing and that they don’t publicly disparage anyone (in an interview, on social media and just in general). As we can see from Kellyanne Conway, crossing that ethical line will eventually catch up to you. 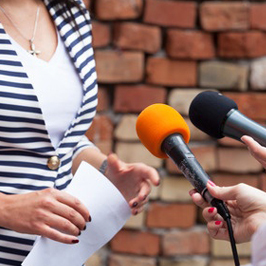 Want more tips on how to work effectively with the media? Contact Vivian Hood at vhood@jaffepr.com.